SLU’s Brock, ‘Bama’s Morgan Headline Primetime Performers Weekly Honor Roll … CollegeBaseball360.com has announced its fifth group of Primetime Performers, for action during the third week of March. St. Louis University senior first baseman Danny Brock (Loveland, Colo.) is the CB360 Primetimer Player of the Week while Alabama sophomore lefthander Adam Morgan (Marietta, Ga.) is the Primetime Pitcher of the Week. Brock and Morgan are joined by 14 other clutch players from throughout the nation in comprising the CB360 Primetime Performer Weekly Honor Roll for May 15-21. BROCK – son of 10-year Major Leaguer Greg Brock (’82-86 Dodgers; ’87-’91 Brewers) – played a lead role in SLU’s doubleheader sweep of a Kansas team that was #25 in the CB360 Composite National Rankings (KU was fresh off a pair of wins at national power LSU). During the pair of convincing wins (12-8/8-5), the 3-hole hitter Brock smacked his 10th home run of the season while batting 4-for-8, reaching base two other times (BB, HBP) and factoring directly into half of the Billikens’ 20 runs (6 RBI, 5 R). 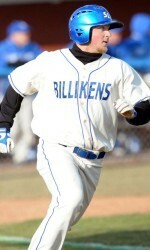 Danny Brock scored or drove in 10 of SLU's 20 runs during the convincing doubleheader sweep of #25 Kansas. The 6-1, 210-pount righthanded hitter led the way for a SLU offense that roughed up a pair of the KU pitching staff’s top righthanded starters – junior T.J. Walz (a 2009 all-Big 12 Conference performer) and senior Cameron Selik. Walz was touched for eight runs and nine hits in 6.1 innings (2BB-6K) while Selik surrendered seven runs and eight hits in 6.0 IP (2BB-7K). Walz was the Jayhawks’ game-1 winner one week earlier at LSU while Selik had started and won the series clincher vs. the defending national champions. Brock’s three-run homer in the bottom of the 7th put SLU ahead for good in the opener vs. Kansas (3-for-4, 5RBI-3R-BB) and he tacked on another strong effort in the game-2 victory (1B-RBI-2R-HBP). He ended the week with a .405 season batting average and was the Atlantic 10 Conference leader in home runs (10), RBI (36), slugging percentage (.892), walks (17) and runs scored (24), plus third in the A-10 with a .525 on-base percentage. He entered this week with an eye-popping 1.417 season “OPS” (on-base plus slugging), through 20 games. CLICK HERE to listen to a podcast interview with Brock. MORGAN delivered #21 Alabama’s 4-1 opening victory in its series win vs. a Vanderbilt team listed 17th in the CB360 composite rankings. The 6-1/180-pound lefthander shut out the Southeastern Conference’s top offense through six innings, ultimately allowing only on run on six hits and three walks through 6.2 innings (3 Ks). The Commodores entered the game with a gaudy .352 team batting average while averaging nearly nine runs and 12 hits per game in the first 17 games of the season (VU was 15-2 before losing to Morgan and the Tide in game-1). Morgan did not allow a Vanderbilt runner to reach second base until there was two outs in the seventh, which also is when VU managed its only extra-base hit of the day vs. Morgan (an Anthony Gomez double; VU’s five other hits vs. Morgan included four 2-out singles with nobody on base). 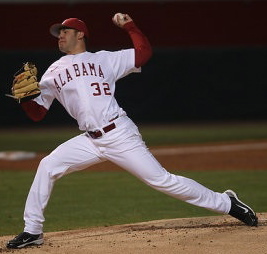 Adam Morgan shut out the SEC's top offense (#17 Vanderbilt) through six innings, leading the Tide to a game-1 victory and eventual series win. In addition to the challenge of facing the Vanderbilt hitters, Morgan had the added pressure of knowing that VU sophomore RHP Sonny Gray (a projected 1st-rounder in 2011) would be facing his teammates. Morgan proved up to the task, rolling up a 1-2-3 inning to start his outing, then allowing a leadoff walk to Jason Esposito but quickly erasing the runner on a pickoff play. Brian Harris had a 2-out single vs. Morgan in the third but was stranded at first, as was cleanup hitter Andrew Giobbi after his single in the fourth. Gomez managed a 2-out single in the fifth, but was forced out at second. Bryan Johns earned a leadoff walk vs. Morgan in the sixth, but he was caught stealing and Giobbi later was stranded at first following his 2-out single. Vanderbilt’s only run came in the seventh, courtesy of two more 2-out hits. Similar to the weekly awards presented on sister site CollegeSoccer360.com, the CB360 Primetime Performer honors various players based on any/all of the following “primetime” criteria…not solely based on raw stats. • Involved in clutch performances, such as late game-winning hits, noteworthy comebacks, game-changing plays, team leadership, etc. The other 14 members of the CB360 Primetime Performer Weekly Honor Roll include: Utah sophomore catcher C.J. Cron (Phoenix, Ariz.), Arkansas jr. CF/RHP Brett Eibner (Houston, Texas), Ball State righthanded reliever Perci Garner (Dover, Ohio), Maryland 1B/RH closer Dan Gentzler (Berwyn, Pa.), Stanford jr. catcher Zach Jones (Draper, Utah), LSU so. LHP Chris Matulis (Lake Worth, Fla.), Florida State jr. RF/RH closer Mike McGee (Port St. Lucie, Fla.), Mississippi LHP Drew Pomeranz (Collierville, Tenn.), Fordham 5th-yr. sr. DH Angelo Ponte (Old Tappart, N.J.), Arizona fr. LF Robert Refsnyder (Laguna Hills, Calif.), High Point jr. RF Nate Roberts (Spring Grove, Ill.), San Diego jr. SS Tony Strazzara (Scottsdale, Ariz.), Florida so. 1B Preston Tucker (Tampa, Fla.) and Charlotte senior catcher Zane Williams (Claremore, Okla.). The 16 honorees include three two-way players (RHP/RF; CF/RHP; 1B/RHP), four other pitchers (three of them lefties), three catchers, two first basemen, a shortstop, leftfielder, rightfielder and DH. The selections feature a 5th-year senior, three seniors, seven juniors, four sophomore and the freshman Refsnyder. Three of the players are Florida natives and two are Arizona products, with all of the others coming from different home states: California, Colorado, Georgia, Illinois, Indiana, New Jersey, Ohio, Oklahoma, Pennsylvania, Texas and Utah.